If you didn't know, we also service your used mowers to get them ready for this season. If it's repairs you need, with a large stock of spare parts for most makes and models, and with over 100 years of combined experience we're sure to put it right for you! Give us a ring or send us an email for more information! At Gardner's we stock a huge range of brand new lawnmowers from small domestic electric mowers to large 30" professional mowers. We have something for everyone here. For those who don't like cutting the grass, we've got robotic mowers - so you don't have to. We are dealers for both Husqvarna Automower's and Viking iMow's. So you can be sure we can get the right robotic mower for you. Visit here for more information. 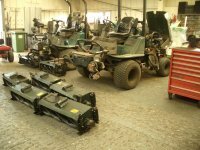 Gardner Engineering specialise in garden machinery such as lawn mowers, chainsaws, and brushcutters both for the domestic and professional/commercial use. These are sold alongside our range of ride-on mowers, shredders, blowers, and hedge cutters. To ensure the high end equipment we sell is maintained or your current gardening machinery is kept in perfect working condition. We also offer servicing and repairs for most equipment and have full parts backup if anything were to break. We are authorised dealers for well-known garden machinery brands such as Stihl, Hayter, Husqvarna and authorised sub-dealers for Honda. More recently we have become dealers for Westwood. Gardners is a family run business established over 20 years ago, since then we have built our reputation on offering friendly, honest advice with competitively priced, high quality products and good after sales service. Our staff have many years of experience in dealing with garden machinery, whether that be repairing, servicing, or general advice on what equipment you need. It is these qualities and expertise that mean our satisfied customers have no issues in recommending our services. We stock a wide range of lawn and garden equipment and all the consumables you need, as well as safety equipment and protective clothing required to use these machines. As well as our engineering workshop and lawn & garden showroom, we are agents for BOC gas. To compliment this service we have a range of welding consumables, equipment and stock including a wide range of nuts and bolts. Our workshop/showroom has plenty of on-site parking and is on Dunslow Road, Eastfield (near Morrison's) Scarborough. We are open Monday to Friday 8.30am to 5pm and Saturday 8.30am to 12.00pm.